Spinach will be in season for another couple weeks. Try it a new way in this skillet souffle, which is made on the stovetop to avoid heating up the oven now that summer is here. The salmon addition is optional. The tomato jam topping is a nice, low-cal and dairy free alternative to cheese, but if you’re short on time, just top with cheese. Slice garlic in half lengthwise, then slice crosswise about ¼” thick, keeping white bottom slices separate from green top slices. Measure out ½ cup of white bottom slices; reserve remaining slices for use below. Heat oil over medium heat in a medium sauté pan (about 8-10”). When it is fairly warm, add the ½ cup white garlic slices and sauté gently for about 2-3 minutes, until just beginning to soften. Stir in tomatoes, sugar (if using), and salt and pepper. Lower heat and simmer until very thick, about 15 minutes, stirring frequently to prevent burning. Remove from heat and reserve. In a large saute pan, heat oil over medium-high heat until quite warm. Add onions and cook and stir about 5 minutes, until just beginning to soften. Add mushrooms and cook another 5-7 minutes until mushrooms brown slightly and their juice evaporate. 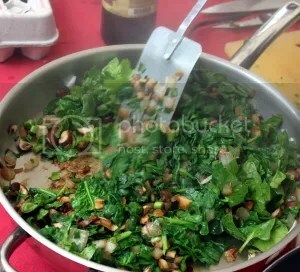 Add spinach leaves or stems and cook another 5 minutes (for leaves) or 8-10 minutes (for stems) until tender, stirring every couple minutes. Lower heat to medium low, push vegetables to sides of pan and add another 1 tsp. olive oil to center of pan. When it is fairly warm, add reserved garlic slices and chili flakes. Saute gently for about 2-3 minutes, until garlic is just beginning to soften. Add salmon, stir everything together and season with salt and pepper to taste. Continue cooking until salmon is heated through, then reduce heat to low and keep warm while cooking eggs. 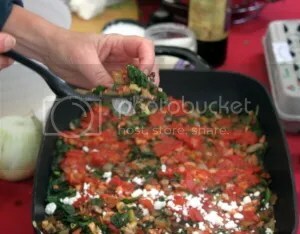 Over medium heat, warm a separate, non-stick saute pan (about 8-10”) and coat lightly with butter. When pan is fairly warm, pour in eggs. Turn heat to low, cover and cook just until puffy like a souffle and all liquid egg is cooked. 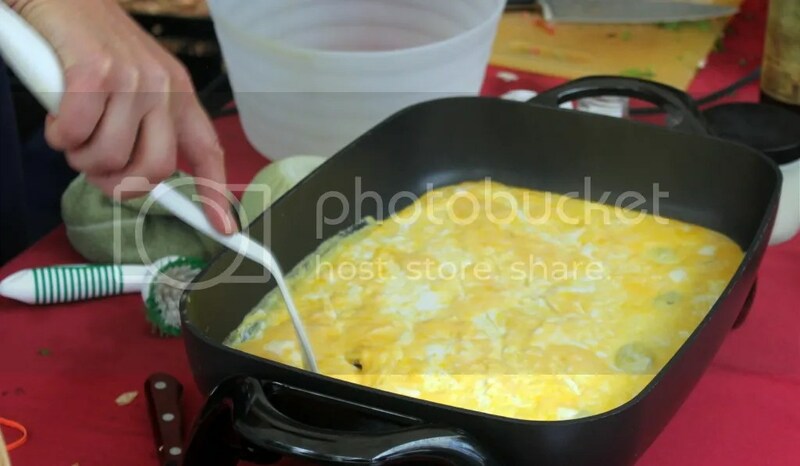 If eggs are becoming too brown on the bottom before top portion is cooked through, gently separate in a few places with the end of spatula and allow any remaining beaten eggs to seep down to bottom of pan.